We're thrilled to announce the release of Sean Lovelace's chapbook How Some People Like Their Eggs, the winner of our third annual short short chapbook contest. More details about the book are here. 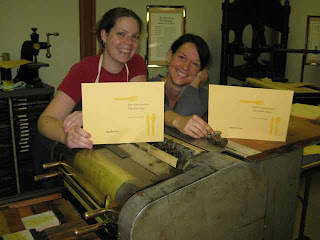 Our fabulous chief book designer Rebecca Saraceno and I letterpressed the covers of How Some People Like Their Eggs at The Museum of Printing in North Andover, Mass. This has become a fun annual tradition for the winning chapbook cover. First we set the type. 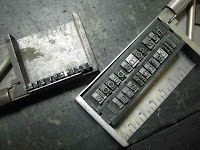 This foundry type is called Stymie. 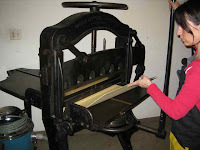 Then we cut the paper down to size using this giant paper cutter. Once we had cover-size sheets, we used a manual Vandercook press to roll out 350 covers printed with the first color (black). 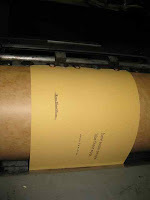 Then we put each cover back through the Vandercook to print the second color (yellow) and set them out to dry on every possible flat surface. Rebecca carved the silverware linoleum cuts herself. After a 14-hour day of printing each cover by hand, we celebrated the beautiful covers with exhaustion and a flat tire on 93. But it was worth it to have each cover carefully and lovingly made to house Sean's amazing stories! Special thanks to The Museum of Printing for the use of their equipment and to Red Sun Press for carefully collating and binding the printed interior and the covers and endpapers we supplied. 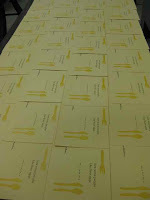 The chapbooks are produced in a limited 300 copy run, so order yours here today! That be wicked! You are too nice. Three egg omelet thank you!